This is a luxurious, well-made Exfoliator. It's gentle and very effective, and will leave your skin baby soft (I have quite dry skin on my body) and this helped my lotion really be absorbed, even my scaly shins are smooth. This is a great exfoliator, and I love having it in my shower. It's gentle, it leaves my skin very silky and it rinses away without leaving a residue. It smells really good too very fresh scent. The scrubbing particles are very gentle and non-abrasive but they exfoliate very well. 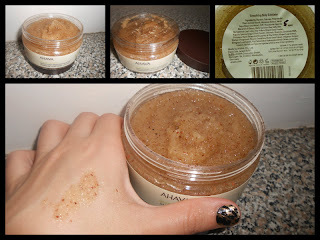 I have been in search of the perfect body scrub & I think I've found it! Most scrubs leave behind an oily film (on you & the tub) this is great if you don't like that feeling. It does what it says, it energizing and smoothes your skin, so if you haven't tried it, go for it. What it Claims: For smoother, radiant skin. Powered by osmoter, AHAVA's exclusive blend of Dead Sea Minerals and infused with an exotic blend of Moroccan Argan shell, Date Kernel and Brown Sugar granules. Indulge in this intensive, energizing experience a nature lends a pampering hand to reveal younger and radiant skin. Packaging: While the aesthetics are lovely, elegant and simple. I do prefer a tub though as it allows me to scoop out what I want and be able to use it all up. Smell: This body exfoliator has a energizing smell. this scrub definitely gives off a lovely aroma. It's like a light ocean and citric scent, and not overpowering. Consistency: It has a thick paste-like consistency, The texture is very unique, non oily, the grains are very effective and you really don't need that much as you apply it on wet skin all over, and you can massage everywhere. This is a delight and it's a product I will always want to have on hand! Ease of Use: This is fairly easy to use. It smooths onto the skin with ease, and washes off without any issue. * Leaves skin beautifully smooth and fresh, clean sensation. * I use it twice a week to pamper my skin. * the overall feeling is wonderful. it feels like your body is getting a gentle yet thorough massage. Apply in circular massage motions to wet body skin. Rinse off. Approved for sensitive skin. Allergy tested, SLS/SLES free, paraben free. Hi﻿ ive just subcribed to you =) wanted to leave a lit message,as i luuuuuvvvvvv these reviews!!!! !